Lindsey’s husband is a fourth-generation farmer. Her family raises corn, soybeans and wheat in Kentucky. So much of my job as a mom of two is figuring out how to do more with less. Use coupons to buy more groceries with less money. Eat breakfast together to spend more quality time together with seemingly fewer hours in the day. Farmers see the same challenges: always trying to do more with less. Thankfully, we have tools like GMOs to help us do just that. A GMO is an organism that has been developed by introducing a new, desired trait or characteristic into its DNA through genetic engineering. 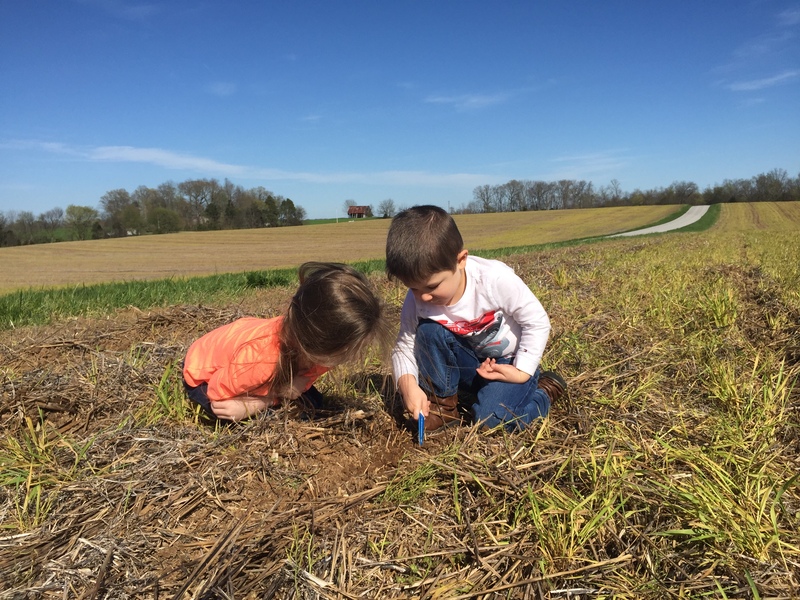 There are many reasons why my family continues choosing to plant GMO crops year after year, but what really stands out are the environmental benefits. Keep reading to learn how GMOs allow us to make these reductions. Genetic engineering allows some plants to resist certain types of insects. Because our GMO soybeans and corn are unaffected by some damaging pests, we don’t need to spray as much pesticide on our crops to battle the bugs. When my husband takes our pesticide sprayer across an acre of land, which is about the size of a football field, the amount of pesticide mixed into the tank is equal to a small latte, or about a cup of chemical mixed with gallons of water. U.S. farmers reduced their pesticide applications by 1.2 billion pounds from 1996 to 2013 due, in part, to the use of GMO seeds. Pesticide use is expected to continue to decrease as more desirable traits become available in the seeds we plant. Decreasing the number of times we need to drive our sprayer across the fields to protect our plants from pests like weeds and insects decreases the amount of fuel we use and the emissions from our equipment. That means less carbon in the atmosphere. And because GMO soybeans and corn are created to withstand some types of herbicide applications used to control weeds, we can be more efficient and precise with our weed management. That has helped us reduce our tillage. Tillage is the process of turning soil in a field, and one of the reasons we used to till was to bury weeds. Tilling a field not only takes fuel, but the process itself releases greenhouse gasses from the soil. In 2012, by reducing tillage on farms, our greenhouse-gas emissions were so much lower, it was like we removed 11.9 million cars from the road. That was largely because of GMOs. Overall, GMOs allow us to reduce the amount of energy and inputs (resources used in farm production, including fertilizer, pesticides and herbicides) we use. And by saving our crops from pests and weeds, we’re able to increase the amount of food we produce per acre. That’s critical for our ever-growing population. We have a limited amount of land on this planet. GMOs allow us to be efficient with it, which empowers us to be sustainable and continue feeding future generations around the world. GMOs help farmers like my husband produce your food safely and sustainably by using fewer resources. That in itself is environmental protection: Growing more food with less pesticide, emissions and land. It’s our responsibility as farmers to be good stewards of the land so we can continue feeding the population, and GMOs are a part of that. Do you have more questions about how GMOs help farmers be sustainable? Ask away! The women of CommonGround are here to help you understand how your food is produced so you can be confident every time you put food on your family’s table. There are definite advantages of GMO crops in agriculture. However, this does not mean that the dangers do not exist as well. Moreover, in the research that I have done, I have found that the idea that it is not necessarily true that GMO crops avoid pesticides, they just occur in a different form. Instead of spraying the crops with pesticides, something that can at least be washed before consumption, GMOs have them integrated into their genetic make-up. This means that a farmer may need to stop spraying their plants with pesticides, but the pesticides exist and are consumed either way. One of the most frequent pest resistant plant is Bt corn. Animal studies have found that Bt corn is very aggressive to the flora of the digestive tract and can cause intestinal damage. As such, the argument on using less pesticides does not make sense. It is merely dressed-up in a different form. Moreover, there are many other dangers such as pest resistance, cross pollination, unintended environmental consequences and ineffective and unhealthy nutritional changes, which makes me doubt whether GMO should be the future of agriculture. I am a hog farmer from Wisconsin. One of our sister sites with 2500 sows were fed BT corn with some concern about the intestinal effects. For one year we converted their feed to Conventional non GMO corn to test this theory. After one year we found no change in production or health of the animals. I understand this is just one study, one isolated incident. However this is the testing that we need to continue to do to make sure we are making the best choices we can with what we are given. You bring up some interesting information about GMOs. Here is some additional information about Bt. Bacillus thuringiensis (Bt) proteins has been used in many organic farms for over 50 years as an agent to control pests. Bt proteins are allowed in organic farming as a insecticide because Bt is a natural, non-pathogenic bacterium that is found naturally in the soil. Bt has also been found to be safe to all higher animals tested (University of California San Diego). When a gene from one organism is purposely moved to improve or change another organism in a laboratory, the result is a genetically modified organism (GMO). It is also sometimes called “transgenic” for transfer of genes. There are different ways of moving genes to produce desirable traits. For both plants and animals, one of the more traditional ways is through selective breeding. For example, a plant with a desired trait is chosen and bred to produce more plants with the desirable trait. More recently with the advancement of technology is another technique. This technique is applied in the laboratory where genes that express the desired trait is physically moved or added to a new plant to enhance the trait in that plant. Plants produced with this technology are transgenic. Often, this process is performed on crops to produce insect or herbicide resistant plants, they are referred to as Genetically Modified Crops (GM crops) (University of California San Diego). Genetically engineered products are not new. Insulin used in medicine is an example of genetic engineering; the insulin gene from the intestines of pigs is inserted into bacteria. The bacterium grows and produces insulin; this insulin is then purified and used for medical purposes. Thyroid hormones, until recently was derived only from animals, now the hormone can be cultured from bacteria. Other genetically engineered products include the chemical Aspartame used in sugar free foods, and the drug hepatitis B vaccine (University of California San Diego).